Florical's advanced traffic interface is compatible with virtually every major traffic system in the U.S. with or without BXF. AirBoss Editor will convert your traffic log to an automation schedule or can create a schedule from templates if a traffic system is not available. Create and edit as far in advance as you can plan. WebEditor is one of our newest additions to the SmartCentral suite of applications that can be accessed from any workstation within the secure Florical network. Password protection allows varying levels of authorization such as “view only”, the ability to edit future schedules, or access to edit on-air schedules directly. Traditional or BXF traffic interfaces come standard with WebEditor. Converts logs for essentially every major traffic system in the U.S. to on-air schedules. Create schedules from templates (for customers without existing traffic systems). Live Log capability (optional). Traffic receives “as-run” updates and missing material notices instantly. Potentially eliminates make-good discounts. Edit future and on-air schedules. WebEditor option gives you instant access from any desktop within the system network with view only or edits only privileges. Easily edit schedules with familiar copy, cut, paste, find and replace operations. Eliminate typing errors with drag-n-drop editing from the media database, daily list, permanent list or other schedules. Use macros to insert groups of events quickly including floater or evergreen replacement breaks. Right click on a schedule field to get a pop-up list for faster data entry. Editor or force a save in RemoteEditor. Make day-of-air changes from master control, traffic, news, or remote locations across the network. Give traffic personnel the ability to create schedules with expanded functionality including secondary events. Confidently run unattended during scheduled programming due to improved schedule accuracy and proven automation dependability. Catch data entry errors, incorrect material or missing material with the Schedule Discrepancy Report. Verify schedule content with actual timed material durations using the Pre-Air Discrepancy Report. Identify space for additional revenue generating commercials with actual material times. Automatically update program segment and spot times from the media database. Create future schedules that are automatically loaded into AirBoss for on-air presentation. No need to load/append next day’s schedule for uninterrupted playout. Create up to 10 schedules per channel each day. 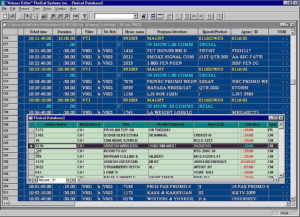 Schedules can be linked together for alternate program scheduling in AirBoss either in advance (scheduled link) or on-the-fly during live programming. Generate play lists for certain video servers so they can run without the automation system. Use AirBoss Editor as a traffic system with daily master schedules, ideal for stations without traffic systems. Easily configure the display by filtering event types, showing specific columns, and changing the column order and size. Control when events run with the most extensive event triggering options available. Reduce billing time and mistakes with the most comprehensive traffic system support. Expand traffic system capabilities by converting comments into special functions like digital video effects, keys & audio overs. Use the Florical Standard Traffic Interface with over 60 fields for comprehensive schedule control. Rely on the unique Billing Reference Number maintained in the as-run-log for consistent traffic reconciliation. Retain all data sent from the traffic system for reconciliation. Accurately reconcile deleted events preserved in the as-run log as “scheduled but not aired”. Record discrepancy notes & variance codes with AirBoss, Remote AirBoss, AirBoss Editor or RemoteEditor. System: Dell / Intel Core 2 computer with Microsoft Windows Windows XP Pro-SP3, 3.0GHz CPU, 2 GB RAM, 160GB HD X2, RAID1. The following items can be scheduled through AirBoss Editor or Remote Editor or imported directly from traffic logs to automate the process of creating a presentation schedule from a traffic play list. Audio/Video Sources: Map the traffic primary audio & video source names to actual device names used in operations. Backup Sources: Assign a backup source to any primary source. Cache to Server: Mark material to be managed by MediaMaster asset management system. Start Triggers: Assign manual or external end triggers for specific live events sources. End Triggers: Assign manual or external end triggers for specific live event sources. Program Filenames: Assign the video server filename for segmented programs. Commercial Filenames: Assign the Agency ID ISCI code as the filename for commercials. Event Group Types: Assign events to a specific group by source including programs, breaks or effects. Maximum Length: Flag event durations that exceed a specified time typically caused by data entry errors. Breaks Only Automation: Optionally add “return to program” event after breaks & comment out unnecessary program lines. Off-Air Proxy Viewing: Interface to the Masslogger allows for automatic recall of any content played to air, by clicking the event in the as-run log that requires viewing. Florical System supports essentially every major traffic system through either GEN ASCI 3, Native Protocol, Print File or BXF protocols. Florical has both standard and Live Log interface with Wide Orbit.